Shiny Mega Marowak in game: 3 Who? Important notice! Pokemon Shiny Mega Marowak is a fictional character of humans. Marowak (Japanese: ガラガラ Garagara) is a Ground-type Pokémon introduced in Generation I. It evolves from Cubone starting at level 28. In Alola, Marowak has a regional variant that is Fire/Ghost. It evolves from Cubone when leveled up at nightstarting at level 28. All Cubone in Alola evolve into this form regardless of their origin. Marowak is a bipedal Pokémon with a spike located on its tail. 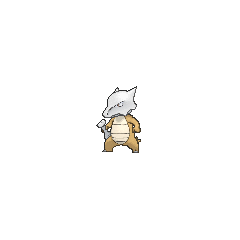 On its stomach, Marowak is very light brown in color, as opposed to most its body, which is a darker brown. Two small claws, one on each hand, serve as its thumbs, and two large nails make up its toes. 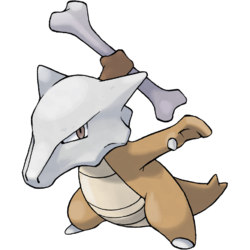 Marowak's head is composed of the skull it once wore as a mask. It can no longer remove the skull, as it became a part of its body. Marowak's jaw is composed of bone, and its nostrils are located on the nose of the skull. Its triangular eyes are brown and are also located on the skull. 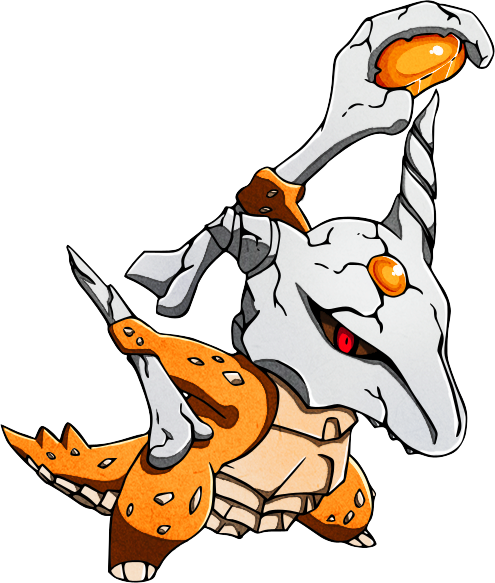 Marowak is well known for ferocity with its bone club, which it is said to collect from a hidden graveyard. It and its pre-evolution, Cubone, are the only known Pokémon that can learn Bone Club and Bonemerang. Upon evolution, Marowak has overcome the grief of its mother's passing. Now ferocious and violent, Marowak is an adept combatant, and uses the bone it carries as a weapon and a boomerang. Marowak have also been recorded pounding on boulders with the bone club it carries in order to tap out messages to others. It lives in mountains to test its skills. In the Alola region, Marowak was faced with an abundance of its natural enemies, Grass-type Pokémon. This harsh environment led it to bond closely with its friends, which is said to have developed a sort of sixth sense and caused it to take a new form. Alolan Marowak rubs the bone it wields against its forehead to light the ends in a green flame, and then twirl the flaming bone. It specializes in an attack where it releases a weak ball of flame from its bone that will relentlessly pursue its foe. Alolans would fear it for a conjurer, due to its rarity and the fearful sight of it dancing with its bone. Alolan Marowak's body is black, and its skull has a dark, flamelike mark between the eyes. Its eyes are also a pale gray. Compared to regular Marowak's squatter, thicker body, Alolan Marowak is relatively thin, making it lighter. White markings echoing shoulder blades, vertebrae, and hip bones also line its back. The bone Alolan Marowak uses is longer then the one regular Marowak use. Marowak first appeared in Bad to the Bone under the ownership of Otoshi, who had recently got his Gym Badges stolen by Team Rocket. The Marowak left Otoshi because it felt that if he lost his Badges, he lost the respect Marowak had for him. Marowak finally decided to come back and help its Trainer when he battled Team Rocket to get his Badges back. Luana, the Gym Leader of Kumquat Island, used a Marowak and an Alakazam against Ash's Pikachu and Charizard in Pokémon Double Trouble. During the first round of the Ever Grande Conference in From Brags to Riches, Morrison's opponent, Gavin, used a Marowak and a Machamp against Morrison's Gligar and Growlithe. In The Ole' Berate and Switch!, Oriba used a Marowak in a fake tournament that was breed by Team Rocket. At the start of Gymbaliar!, Jessie faced an opponent named Jeffrey with a Marowak. It defeated her Dustox. A Trainer's Marowak appeared in The Mandarin Island Miss Match. A Marowak appeared in Beauty and the Breeder where it participated in a Pokémon breeding competition. Marowak also appeared in the opening of Destiny Deoxys and Lucario and the Mystery of Mew. A Marowak appeared in Showdown at Linoone. A Coordinator's Marowak appeared in Dawn's Early Night!. It was used along with a Cubone for the Double Performance required during the Hearthome Contest. Halverson used a Marowak in Pokémon Ping Pong Tournament in To Thine Own Pokémon Be True!. A Marowak appeared in a flashback Dealing With a Fierce Double Ditto Drama!. A Marowak made a cameo in Arceus and the Jewel of Life. A Marowak appeared in SS028. EP073 Marowak Ash's Pokédex Marowak, a Bone Keeper Pokémon. Despite its small size, its offensive and defensive strength is impressive. 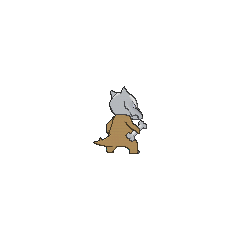 Marowak appeared in File 2: Cubone. Marowak debuted in A Tale of Ninetales where a wild Marowak attacked two of Blue's fan girls. Super Nerd Miles used a Marowak in Whacked by Marowak! in Pokémon Adventures to attack Yellow using its Bonemerang. In Innocent Scientist, A Marowak appeared in a flashback as a Pokémon trained by the International Police. Pokémon Red, Blue, Yellow, FireRed, and LeafGreen: Marowak was killed by agents of Team Rocket, leaving a Cubone as an orphan. With the Silph Scope, her ghost could be seen in Pokémon Tower. It can only be caught by using a cheating device. After fainting in a battle, a message will pop up saying that the Marowak's soul has finally moved on to the afterlife. This message, however, still shows up even if the player actually caught the Marowak with a Gameshark or Action Replay given that the Marowak is not supposed to be catchable. Pokémon Mystery Dungeon: Explorers of Time and Explorers of Darkness: Marowak runs a training dojo the same way Makuhita had one in the first series. The bone it holds is its key weapon. It throws the bone skillfully like a boomerang to KO targets. Small and weak, this Pokémon is adept with its Bone Club. It has grown more vicious over the ages. Originally a small and weak Pokémon, it became rough and aggressive when it begin using bones as weapons. It has been seen pounding boulders with the bone it carries in order to tap out messages to others. It collects bones from an unknown place. A Marowak graveyard exists somewhere in the world, rumors say. Somewhere in the world is a cemetery just for Marowak. It gets its bones from those graves. A Marowak is the evolved form of a Cubone that has grown tough by overcoming the grief of losing its mother. Its tempered and hardened spirit is not easily broken. It is small and was originally very weak. Its temperament turned ferocious when it began using bones. From its birth, this savage Pokémon constantly holds bones. It is skilled in using them as weapons. It collects bones from an unknown place. Some whisper that a Marowak graveyard exists somewhere in the world. Marowak is the evolved form of a Cubone that has overcome its sadness at the loss of its mother and grown tough. This Pokemon's tempered and hardened spirit is not easily broken. Originally, it was weak and timid. After evolution, its temperament becomes violent, and it begins to wield bones as weapons. This Pokémon is out for vengeance on its natural enemy, Mandibuzz. It throws bones like boomerangs to try to take it down. The bones it possesses were once its mother's. Its mother's regrets have become like a vengeful spirit protecting this Pokémon. Its custom is to mourn its lost companions. Mounds of dirt by the side of the road mark the graves of the Marowak. This Pokémon's Special base stat in Generation I was 50. Alolan Marowak has the same stats as a regular Marowak. If this Pokémon is given a Ring Target and its Ability is not Lightning Rod, the effectiveness of Electric-type moves is 1×. If this Pokémon has Lightning Rod, the effectiveness of Electric-type moves is 0×. Moves marked with a superscript game abbreviation can only be bred onto Marowak in that game. 51%-100% HP This bone flies like a boomerang! 26%-50% HP Watch out for me. My health is down to about half. Level up Yes! I went up a level! My boomerang throwing is in peak form! Marowak are seen in the Cavern Zone and Granite Zone. Blaziken's Boulder Bash is their favorite Attraction. Does more damage the more times in a row it is triggered. 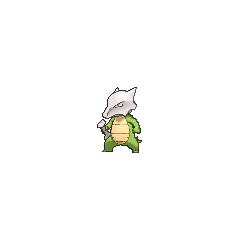 For other sprites and images, please see Marowak images on the Bulbagarden Archives. In the Pokémon Red and Blue beta, Marowak was originally known as "Guardia". This is the Spanish word for guardian. According to some of Marowak's Generation II and IV Pokédex entries, somewhere exists a legendary Marowak graveyard. This is a reference to the Elephants' graveyard of modern myth. Until the release of Pokémon Black 2 and White 2 and the appearance of Black and White Kyurem, Marowak was the only Pokémon in the main games to be found in a location where it was not able to be caught at all. Alolan Marowak is the only dual-type Pokémon with a pre-evolution that shares no types with it. Marowak is reptilian in nature and may be based on bipedal dinosaurs. Alolan Marowak's design may draw inspiration from fire knife, a Samoan traditional dance implement. Alolan Marowak also may draw inspiration from the Polynesian concept of mana, a spiritual essence that exists in all objects and people. It also allows people to imbue their "spirit" into other people and objects for protection or vengeance. Marowak is a combination of marrow and whack. Garagara may be taken to mean がらがら (clattering). It is worth noting that garagara denotes heavier clattering than からから karakara. Japanese ガラガラ Garagara Onomatopoeia meaning "a heavy clattering"
Mandarin Chinese 嘎拉嘎拉 Gālāgālā Transliteration of Japanese name. 嘎拉嘎拉 also refers to a rattling sound.